CNN, others in media, blow Supreme Court decision on healthcare… So now can we get some responsiblity in reporting? My television tuned to the network morning programs; my browser displayed a handful of news sites and Twitter. With breakfast in hand, I was in full breaking news mode Thursday morning, awaiting word of the Supreme Court’s opinion on the Affordable Care Act. More simply, healthcare reform; more partisan, Obamacare. A few minutes after 9 a.m. central time, every major news network was on the air, trying to be the first to summarize the 193-page opinion. CNN, the former cable news king now in dire need of ratings, was the first major source to make a declaration. Individual mandate: Unconstitutional. Healthcare law: Thrown out. On-air, online, on social media, through email blast, CNN was ready to celebrate an all-out, multi-channel, breaking news of the year scoop! Except they were wrong. A misreading of the opinion, they claimed. Individual mandate: Constitutional. Healthcare law: Upheld. CNN wasn’t alone (though they were certainly most prominent). Fox News displayed the incorrect opinion on a banner during their live television coverage. A number of Republican political figures jumped the gun in celebration. Others goofed. Read all about it. It used to be that getting a scoop mattered. 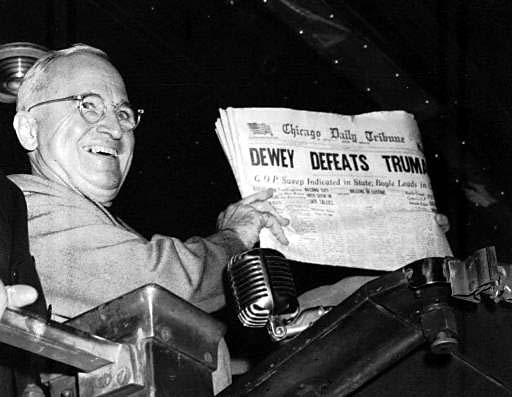 Beating a competitor by an entire day in a printed newspaper really meant something. But today, when information is disseminated over various channels within minutes (or seconds) of each other, does being first really mean that much? Is it worth being wrong? Ask CNN. Sure, the tagline could have read: “We get you the news 11 seconds before the other guys.” Enviable, to be sure. Instead, they made “The most trusted name in news” read like a relic from a time when their newsroom had some sense. 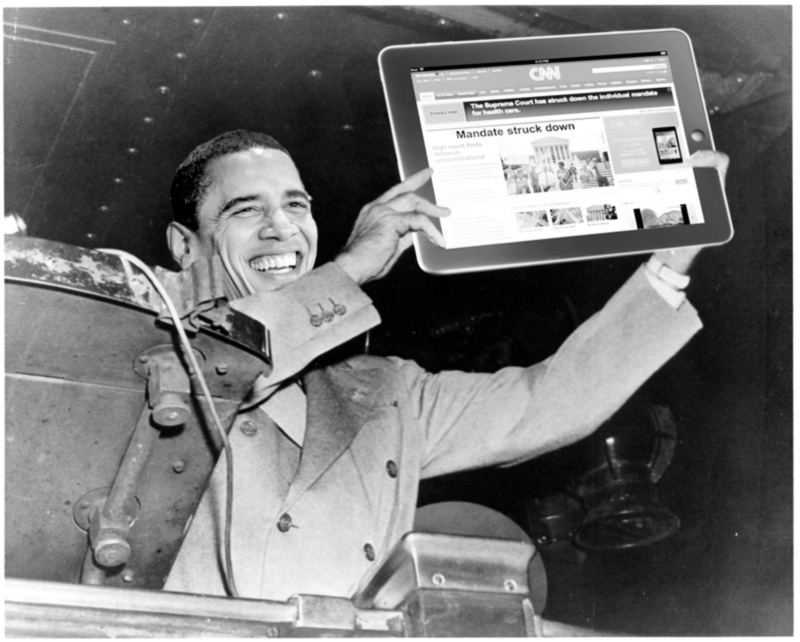 The error even grew into a meme, when comparisons to the most infamous of all incorrect scoops, the 1948 Chicago Tribune “Dewey defeats Truman,” met this updated image of President Obama checking out CNN on his tablet. The original image from the original goof-scoop. Courtesy Wikimedia Commons. The New York Times, though certainly not alone in realizing a responsibility to be right, perhaps elocuted it best. “It’s almost stupidly obvious to say, `We want to be right,’ but we want to be right,” Assistant Managing Editor Jim Roberts told the Associated Press. This unfortunately isn’t new. The desire to be first trumps the need to be right all the time, even in stories of life and death. Remember January 2011, when numerous outlets (including CNN) incorrectly reported Arizona Congresswoman Gabrielle Giffords to be dead? Or January 2012, when CBS and other outlets did the same thing regarding Penn State football coach Joe Paterno. How many more major mistakes are we going to endure for the sake of scooping competitors in a digital world where bragging rights only last a matter of seconds? This is a new era. An audience is no longer earned by being first; it’s earned by being factually correct and innovative in storytelling. Perhaps the beating CNN and their brethren are taking today will serve as a wake up call.